Our purchase of wind power to accommodate up to 30% of our energy needs. Our use of solar power to provide on average 17% of the electricity required to operate the two plants. Our partnership with Montgomery County GreenFest, where we teach approximately 500-600 customers how they can reduce their carbon footprint. Our Children's Water Festival where over two days in May, WSSC teaches 600 fourth graders about the environment. Our Managed Hunt Program to reduce deer damage to the watershed forests and surrounding properties. Our Sewer Science Program provides high school students the opportunity to learn what it takes to be a wastewater treatment plant operator. 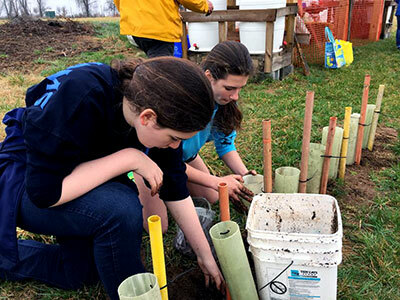 Our partnership with the Maryland Chapter of American Chestnut Foundation in support of their breeding program through 3 orchards of chestnut trees. For information about the WSSC Patuxent Watershed, including permit information, watershed regulations and FAQs, go to the section on Patuxent Watershed under Education and Recreation.